Chevrolet Corvette Stingray––all-new for 2014, the most award-winning car of 2014, and 2014 North American Car of the Year––gets even better for 2015 with a long list of performance and design enhancements highlighted by an all-new eight-speed paddle-shift automatic transmission, standard OnStar with 4G LTE and built-in Wi-Fi hotspot, and an industry-first Performance Data Recorder. 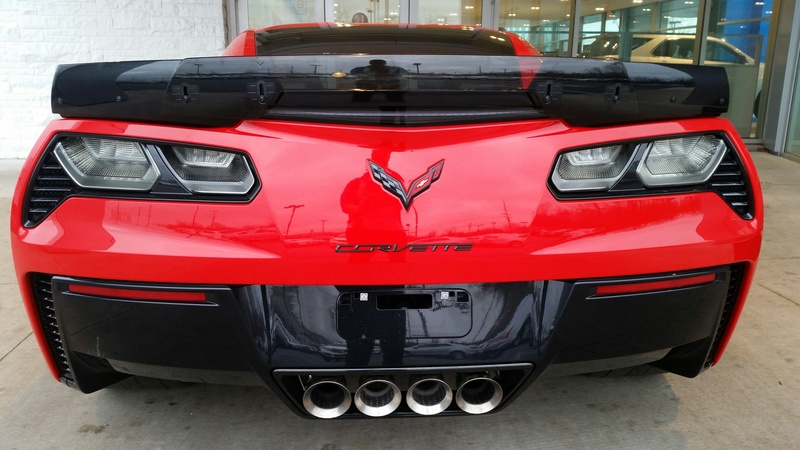 The rear-drive 2015 Chevrolet Corvette Stingray (MSRP $55,000) also offers two new design packages, Atlantic and Pacific, the former showing off a luxury sport GT theme and the latter a high-performance motorsport theme. Open the standard carbon fiber hood and check out the 6.2-liter LT1 V8 engine, which produces an exhilarating 455 hp and 460 lb/ft of torque. An available performance exhaust system ups power to 460 hp and 465 lb/ft of torque. 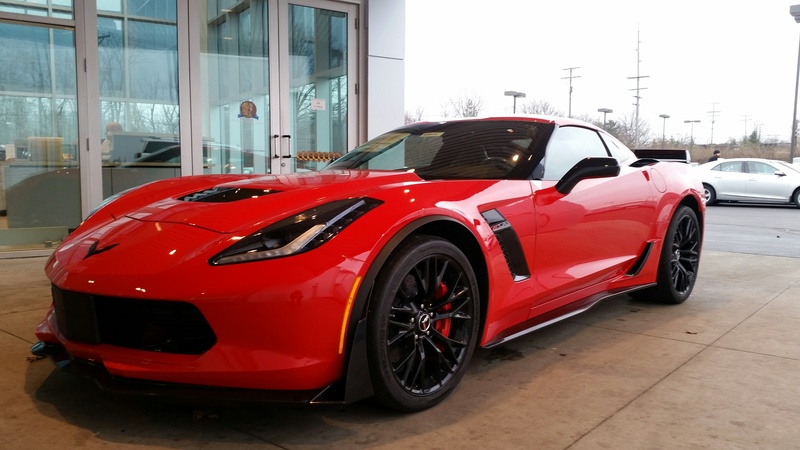 The performance numbers of a Corvette Stingray equipped with the Z51 Performance Package are staggering: zero-to-60 mph in 3.8 seconds, quarter-mile in 12 seconds at 119 mph, 1.03g cornering grip and a 60 mph-to-zero stopping distance of only 107 feet thanks to standard four-piston-caliper Brembo brakes. Z51 models also include a dry-sump oil system, to ensure adequate lubrication at speed. Another amazing Corvette Stingray stat concerns its fuel efficiency, which is EPA-estimated at 29 mph highway when equipped with the available new seven-speed manual transmission with Active Rev Matching. Thanks to direct injection and Active Fuel Management cylinder deactivation, the Corvette Stingray is by far the most efficient sports car on the market with more than 450 hp. The available new eight-speed automatic was designed and built by GM. It offers shift times that stand with the best dual-clutch automatics, and it’s expected to increase fuel efficiency by up to five percent compared to the previous six-speed automatic. Both the seven-speed manual and the eight-speed automatic will offer Launch Control. 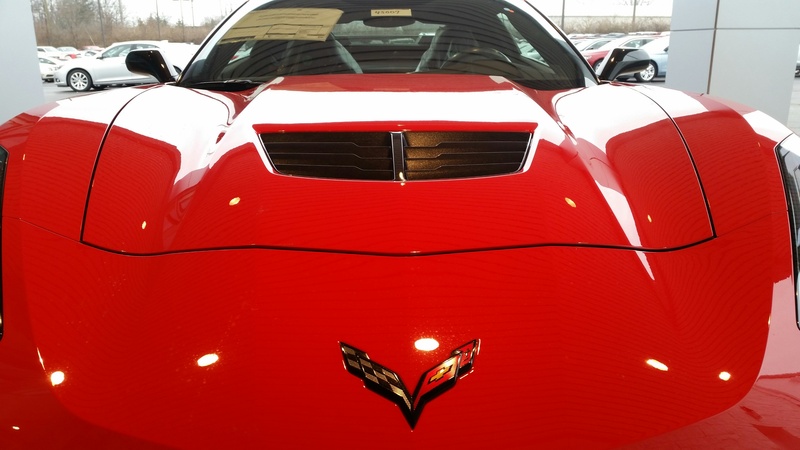 Lightweight, ultra-high-strength aluminum, carbon fiber, advanced manufacturing techniques and a perfect 50/50 weight balance help the 2015 Corvette Stingray excel in both acceleration and cornering. For 2015, 35mm-piston Bilstein shocks come standard on the Corvette Stingray, with 45mm-piston Bilstein shocks and Magnetic Ride Control featured on Z51 Performance Package models. 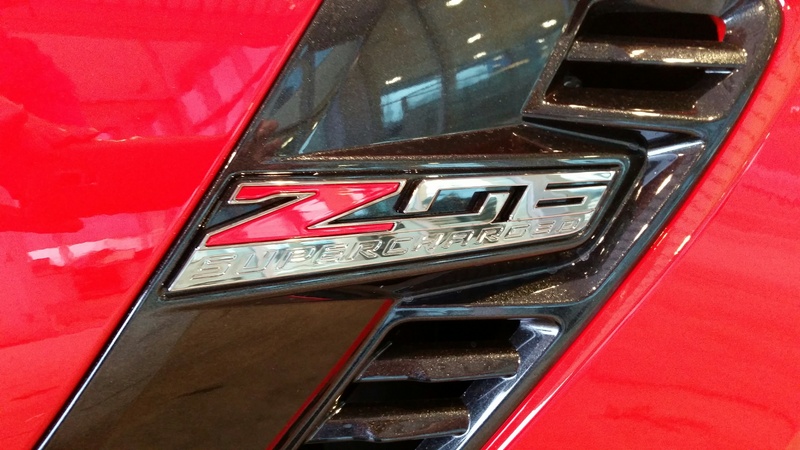 The Z51 package also features an electronic limited-slip differential (eLSD) to shift power and traction based on vehicle speed, steering and throttle position. Outside, the Corvette Stingray is provocative, bold and extremely aerodynamic. Advanced lighting is a central feature of the Corvette Stingray, which features LED headlamps and taillamps; the LED taillamps integrate functional aircraft-type outlets for available transmission and differential coolers. Every Corvette Stingray coupe features a removable body-color carbon fiber roof panel or an available transparent roof panel. For those who prefer open-air motoring, the Corvette Stingray convertible features an electric top that can be lowered remotely in just 21 seconds at traveling speeds up to 30 mph. Inside the Corvette is the hand-crafted, fighter-jet-inspired, two-seat cockpit of a world-class supercar, complete with a 14.1-inch diameter steering wheel for more direct steering feel, available Nappa leather upholstery and a choice of two seat options: GT for more all-around comfort and more heavily bolstered Competition Sport for track duty. Available trim options include carbon fiber, micro-suede and aluminum to help customize and enrich the driving experience. The Corvette Stingray is completely driver focused, featuring technologies like the Driver Mode Selector with five settings––“Eco,” “Tour,” “Sport,” “Track” and “Weather”––for optimal driving performance all the time. The award-winning, industry-first Performance Data Recorder (PDR) lets drivers record high-definition video, with telemetry overlays, of their on- and off-track driving experiences. Developed in part with Cosworth, the PDR system seamlessly integrates a camera, microphone, telemetry recorder, and a dedicated SD-card slot in the glove box for transferring data. An 8G card can store more than three hours of driving footage, while a 32GB card can store more than 13 hours. The PDR can record and overlay data that includes speed, rpm, g-force, lap times, zero-to-60 sprint times, quarter-mile times and zero-100-zero mph runs. Drivers can view all the data on a high-resolution eight-inch touch-screen on the center stack, and thanks to new Chevrolet MyLink with OnStar 4G LTE connectivity and built-in Wi-Fi hotspot, PDR data can be shared with friends right from the cockpit. The 2015 Chevrolet Corvette Stingray is a motoring legend and an engineering marvel, and the only way to truly appreciate its magic is by sitting behind the wheel. There’s quite a bit more to discover about the 2015 Corvette, so schedule your test drive today.